Yesterday morning we were in Livorno, about 90 minutes from Florence. Dinner at the Colonnade (the less formal dining room with lots of outdoor tables) that night was going to be a Tuscan Market Dinner, and the ships’s executive chef, Franck Sollazzo, was going shopping with 20 of his hungry customers, two of whom were us. 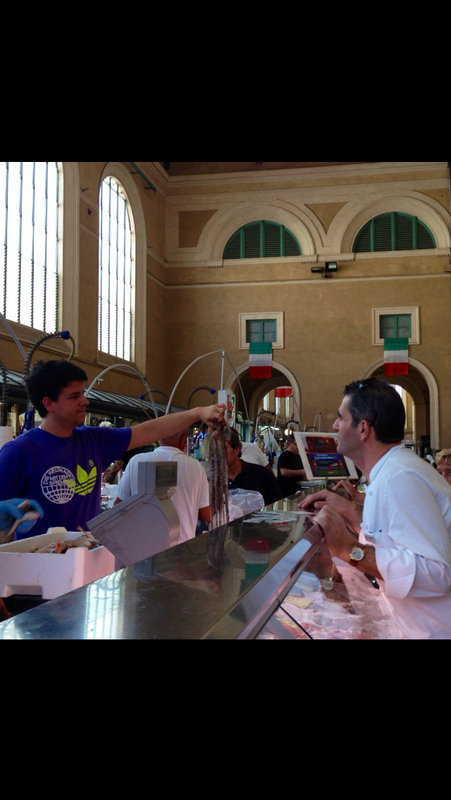 Although the chef is French, his family is Italian and they shopped at the Livorno market when he was a kid. He knew what he was doing. I thought, frankly, that the thing would be a bit of window dressing, just for show, but that the ship’s food (for 450 guests over four restaurants) would arrive from commercial suppliers. Some of that is probably true, but this shopping trip was the real deal — Chef was on a mission, trailed by his sous chef with a heavy duty trolley to carry his very substantial purchases. The market was a great one — partly indoors under cover and partly out. 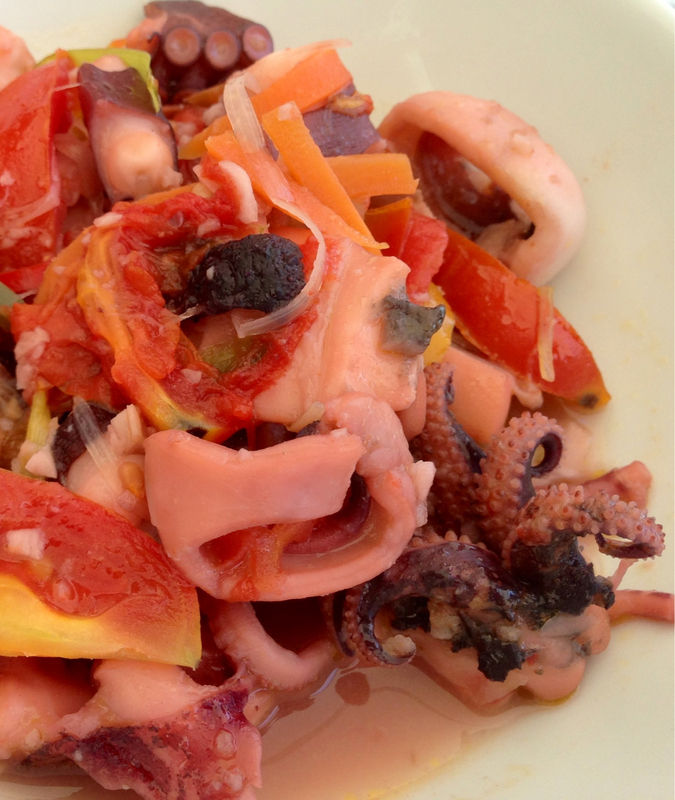 We started with fish — Chef bought kilos of mussels and huge handfuls of octopi and cuttlefish. He searched for sardines, bought trays of fresh anchovies, filleted by hand by fishmongers whose fingers knew what they were doing so well they didn’t even need to look. 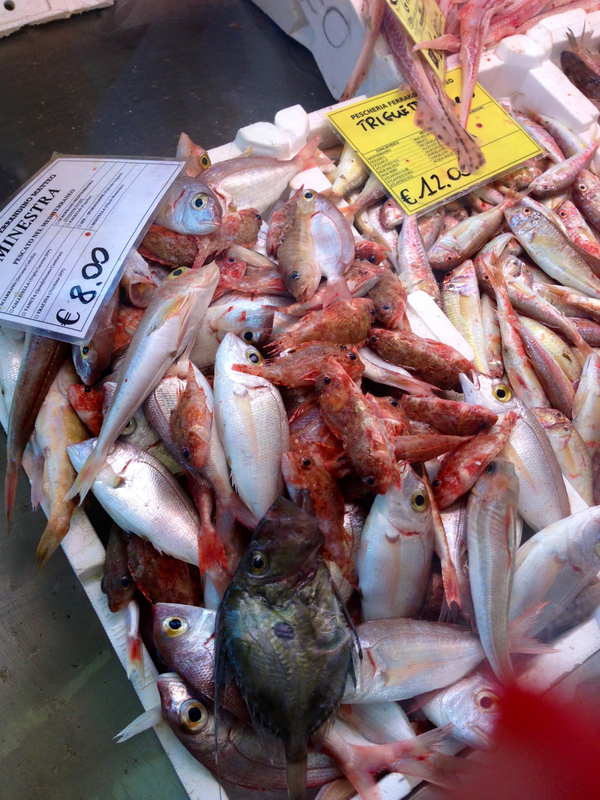 And for fish soup, a Livorno specialty (a specialty all over the Mediterranean, actually) he bought up lots of tiny fish — scorpion fish, St. Pierre, and other little bony fish, sold in bulk to make the broth. I don’t think I am likely to get my hands on these little guys myself, but if any of you should find yourself making Italian fish soup, I have it on authority that it is the scorpion fish that are truly crucial to the finished product! So last night we went to the Colonnade for dinner and there were the mussels, sautéed with garlic and wine and a drop dead amazing Livorno Fish soup. The tomatoes were there, sliced and layered with mozzarella. 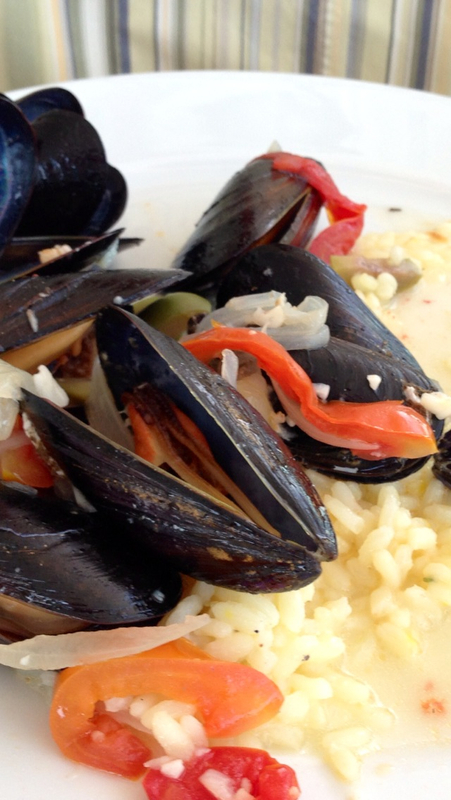 This morning there were ripe peaches for breakfast and lunch today in the Colonnade was a seafood theme — Jer had more mussels and a seafood dish full of octopus sautéed on the spot with garlic and tomatoes.